Paddleboards When to Rent vs. Buy? Okay, so a lot of paddlers ask us what kind of boards to buy, where they can rent boards, and what board is right for them. Well if you do a short search online, you can easily find there is an ever growing variety of boards, materials and manufacturers. So the biggest question isn’t which is the best board, but which is the best board for you? For many people who want to paddle 2 or 3 times a year, renting is the best way to go. There are a few great places to rent boards, Lake Calhoun is one of the more popular if you don’t mind waiting in line, as well as midwest mountaineering, if you don’t have a problem transporting the board yourself. One of my favorite parts of Stand Up MN’s business is that you don’t need to transport the boards yourself and we operate on a one-way river, which means you can paddle 3 times the distance in the same amount of time, a totally unique experience for most paddlers in MN. We have used Pau Hana’s boards for the past 4 years for a few reasons. They seem to be innovators in the industry, always tweaking their previous designs to create better boards, cooler designs and more practical features. They also have won a few awards which helps with their paddle credentials. We use their soft tops, (no longer available) because they give us a much faster and more maneuverable board than the boards seen at Calhoun Lake and they hold up to the beating we give them on our river adventures. We seriously put these boards to the test and they pass with flying colors. Last year, we heard they weren’t going to be making them again because they are focusing on their epoxy line-ups and so we stocked up and bought 22! So our advice, if you want a board to paddle with at your cabin, buy a Pau Hana Big E-Z. 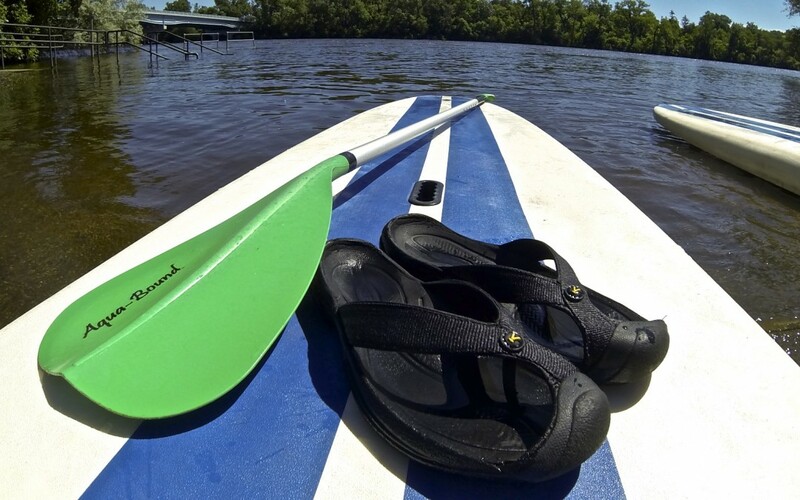 These hold enough weight to comfortable paddle with your kids, dogs, or carry a cooler. They also have a stable base for practicing yoga or fishing, a great all-around board. If you are a racer, and need a board to train and beat the heat, get the award winning Crossfit. If you want something really special, call up the cool guys at Idol Surf and have them make you a custom board with graphics and specifics you detail. We did and we love them! If you are the causal paddler, let us carry, store and maintain the boards for you and your friends. Sign up online and you won’t have to wait in long lines. If you are more competitive, sign up for our new racing series! It’s only $40 and we will be racing in heats of 10!